Ceramic yarn Bowl, in the shape of a sympathetic llama, with its orange blanket woven with borders and its proud bearing; It seems very sure that it will be your right hand and that it will have controlled the balls. I would not take the opposite! It is modeled so that the ball lodges in the body of the llama and rests on 4 short legs that give it a very funny touch. 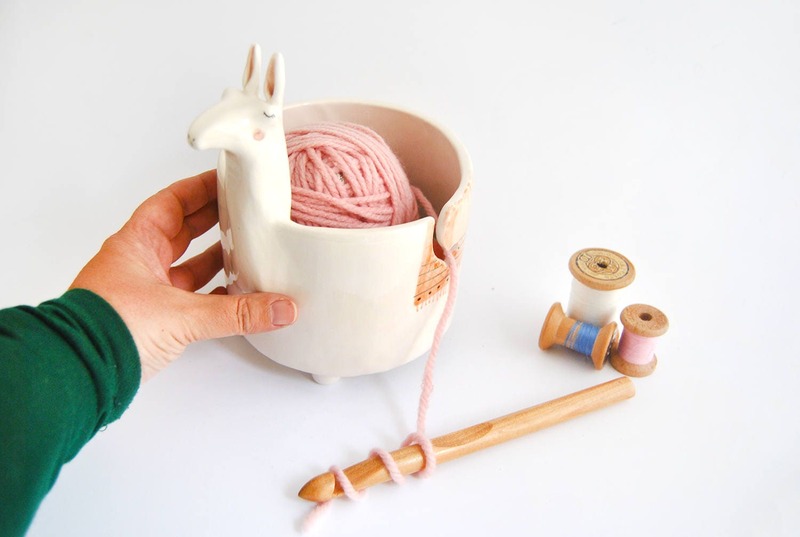 The long neck and the head with their stiff ears complete the set turning this yarn bowl into a very original piece. It prevents your ball from hitting the ground. Simply put the ball inside and pass the wool through the hitch. It is made of white clay or earthenware using the ceramic technique of the double fire. The decoration is made with inorganics pigments and the final layer is a transparent glaze of great hardness. Dimensions: Diameter 14 cm (5.51 in), Height 10 cm (3.94 in), 19 cm ( 7.48 in) including legs and head. *** Woolen balls, wooden crochet hooks or other objects in the photograph are not included. * Each piece of this collection is handmade and unique, so it may differ slightly from the photographs. We try to send all the orders with the best courier companies so that your package arrives as fast as possible and safely. For optimal management of your shipment, a contact phone number of the recipient is required to contract the service. You can leave it in a note when placing your order or send us a message with that information. All data and other information you provide us will be absolutely confidential. Lovely item, as described. When the first one arrived damaged, they sent a replacement without hesitation. Love it but hate that the llama ear broke off in shipment so my sister had to glue it back on.